Chinook Landscaping now installs courtyard stone. 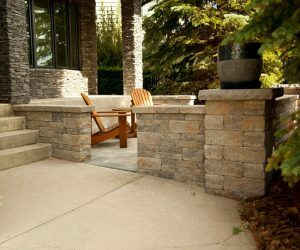 Creating beautiful stone fences or perimeters around your patio can be done by utilizing a product called Courtyard stone. This stone creates a strong bold statement and provides protection and privacy. It also adds value and class to any landscape. Commonly used for stone fence along the borders of properties, Courtyard stone can also be used for borders along patios and walkways. It is available in many different styles and colors, from old world Dublin Wall to Santa Fe. The look of the Dublin wall was designed to mimic the century-old yards walls found in Dublin Ireland. Add a new dimension to your patio terrace or anywhere on your outdoor landscape. Our installation process is fast and efficient without compromising quality. This stone is ideal for outdoor landscapes and can be used to help create the perfect outdoor kitchen for your backyard. We can build you stone counter tops, BBQ and grill platforms, and even beautiful stone bench seating to add a cozy modern look to your landscape. Click here to learn more about our outdoor kitchens. Attractive and elegant stone is an investment in your property that adds real value to your home. Installing courtyard stone gives your landscaping a beautiful classic look that sets you apart from your neighbors. There is nothing typical about these beautiful stone accents and you won’t have to paint, stain, or maintain the stone at all in the future.